Johnny Brooks (Johnny B.) Edwards, age 78, of Fair Bluff, N.C., died Monday, March 19th, 2018 at Lower Cape Fear Hospice & LifeCare Center in Wilmington, N.C. Born August 9, 1939 in Fair Bluff, he was the son of George Owen Edwards and Miriam Kellihan Edwards. 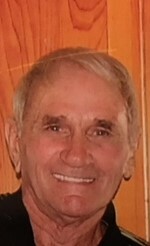 Johnny B. was a graduate of Fair Bluff High School and Pembroke State University. He was employed as a teacher and coach, retiring after sixteen years from the Columbus County School System. Johnny B. was also a devoted member of the Fair Bluff Baptist Church in Fair Bluff, N.C.
Johnny B. will be remembered as a loving father, grandfather, and friend. He especially enjoyed spending time with his grandchildren including attending many athletic games, church musicals, and dance recitals. He loved the outdoors, especially Lumber River. He shared many happy times with his "brothers" from Fair Bluff, hunting, boating, camping, playing cards, and of course, eating. In his earlier days, he loved playing golf and shagging with his friends, including, Vivian, the mother of his two children, who was still a supportive presence in his life until the very end. He is survived by his two children, Samantha Edwards (Keith) Alsup, of Lake Waccamaw N.C., and Cameron Brooks (Sharon) Edwards of Wilmington, N.C.; his sister, Shirley Edwards Million; six grandchildren, Carson Brooks Edwards, Cade Nicholas Edwards, John Brian Alsup, Rylan Paul Edwards, Blake Madison Edwards and Katherine Marie Alsup; and two nieces, Kristin Edwards Wendor and Megan Edwards Storer, and their mother, Carole Scarboro Edwards. Johnny B. is predeceased by his parents, George Owen Edwards and Miriam Kellihan Edwards; a brother, Fred Eugene Edwards; and a niece, Amy Rogers Jordan. Funeral services will be held on Saturday, March 24, 2018 at Fair Bluff Baptist Church in Fair Bluff, N.C. at 2 pm. Burial will follow in Powell Cemetery. There will be no visitation. In lieu of flowers, please make donations in honor of Johnny B. Edwards to Lower Cape Fear Hospice, 206 Warrior Trail, Whiteville, N.C. 28472, or to Fair Bluff Baptist Church, 1205 Main Street, Fair Bluff, N.C. 28439. A service of Meares Funeral Home of Fair Bluff.